One of the best facials I've ever had. Great hands! Nice peaceful environment, you really feel like you're getting away. One of the best facials I have ever received. The atmosphere was relaxing and inviting. I have been getting facials about 10 years, this is one the best ones with the longest lasting results. Lisa S.
Read Our Reviews! We Have 5-Star Reviews ! Ideal for anyone who wants to reduce fine lines and wrinkles or if you want to clear up acne and blemishes. Do you have or are you are starting to see fine lines around your eyes, forehead and mouth? Are your fine lines becoming a bit too prominent? Erase these wrinkles and lines with our LED Skin Rejuvenation! It works! 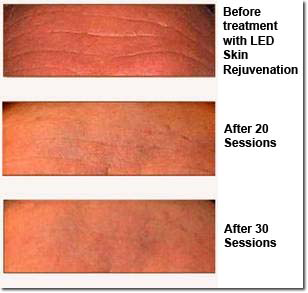 LED Skin Rejuvenation: It's Like a Plant Light for Growing Collagen. This proven technology was developed by NASA, and is F.D.A. approved. Click here to read NASA Article. It is backed by over 100 clinical studies! It is completely painless, cool to the skin, non-invasive and is quite relaxing. A session only takes 30 minutes. No down-time! 1 or 2 treatments will really help your skin, visible results may be seen in 4-6 sessions. We have 2 machines so you can usually get in when you want. A true skin care break-thru! Add an HA Peptide Mask for even better results! It's based on the science of stimulating collagen production, naturally filing in and erasing fine lines and wrinkles�amazing results you have to experience! As we age, collagen production in our face diminishes, making the skin less elastic, causing wrinkles. The result; aging takes effect. 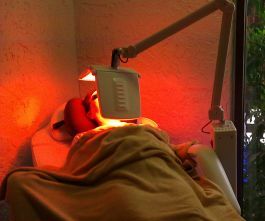 By stimulating the cells with LED Skin Rejuvenation Therapy, you can get the results you seek. Just like a plant light with a specific wavelength that helps a plant to grow; our light therapy stimulates the growth of lost collagen and elastin � the result; it naturally fills in your wrinkles! We use light to whiten our teeth. Now use light to remove wrinkles! It's painless. This is like getting injectable fillers for your face, only naturally! This Technology Works! It also naturally plumps your lips! From Europe and previously only available in the U.S. to Hollywood celebrities and in a few high-end spas, it's now available for you � only at ISCI! This is monochromatic cool temperature L.E.D. technology with specific wavelengths. These are not red florescent light bulbs used in some tanning salons. Our LED Skin Rejuvenation works extremely well on clearing up blemishes and acne. Using a different wavelength of light, these sessions can clear up acne. Acne is mainly caused by acid bacillus; the LED skin rejuvenation therapy can destruct these bacteria with no injury to skin tissue, decreases acne break-outs, decrease and cure acne during inflammation period in very short time. Rosacea, Seborrhea, Eczema, Psoriasis, Acne (Inflamed and Non-inflamed), and Sun-Damage (Hyper-pigmentation, Melasma, Chloasma) skins. Thyroid condition � if you suffer from a thyroid condition. You can do LED if you have your thyroid under control with medication. If you are photo-allergic, or are taking any medication that causes light sensitivity, such as Tetracycline. Be the First to Experience LED Skin Rejuvenation! See Dramatic Results. Works on Every Skin Type! You'll Love It! 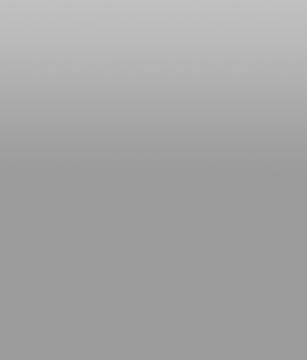 From Europe - Highly Effective � Gets Results! Works on all skin types! Skin becomes more radiant and nourished! Turn back the hands of time using this new technology! It naturally plumps your lips as well! A Word on LED Skin Rejuvenation: LED Works. It's proven with over 100 clinical trial studies. You will not see any physical improvement in just 1 or 2 treatments, but it is working. You will typically begin to see a difference in the reduction of your lines and wrinkles in 4 to 6 treatments. Remember, your lines & wrinkles occurred over years, and you are doing a 30 minute treatment�give it a chance and do 4-6 treatments as close together as you can�you won't be let down and you will look more youthful! We have 3 LED Beds for your convenience. Eye and upper face wrinkles and skin damage. 8 Sessions with LED Skin Rejuvenation over 4 weeks.